I love spending quality time with my lovely mum. We don’t get to do it too often, which may sound a little strange as we see each other every day (I’m living back with my parents while I recover from CFS). But there’s something really special about making nice plans to spend the day together. Months ago, when we heard the new James Bond film, Spectre, was due for a November release, we agreed to see it together and would top it off with a yummy lunch. Mum is a huge Bond fan, and while I don’t normally go for action films, I’ve a penchant for a good Bond adventure. After what has seemed like a long wait, the latest 007 installment has finally opened in our cinemas. We set off for the first showing of the day, and were quite surprised to be joined by a good few other cinema goers: 10:30am on a Monday morning! I think Daniel Craig is incredible as James Bond. This may be controversial to die-hard Bond fans, but for me he’s taken over Sean Connery as my favourite ever 007. And his fourth outing was an action-packed 148 minutes and we left feeling exhilarated (and dying for the loo!!). I’ve been looking forward to going to George’s, a new-ish fish restaurant in the city. 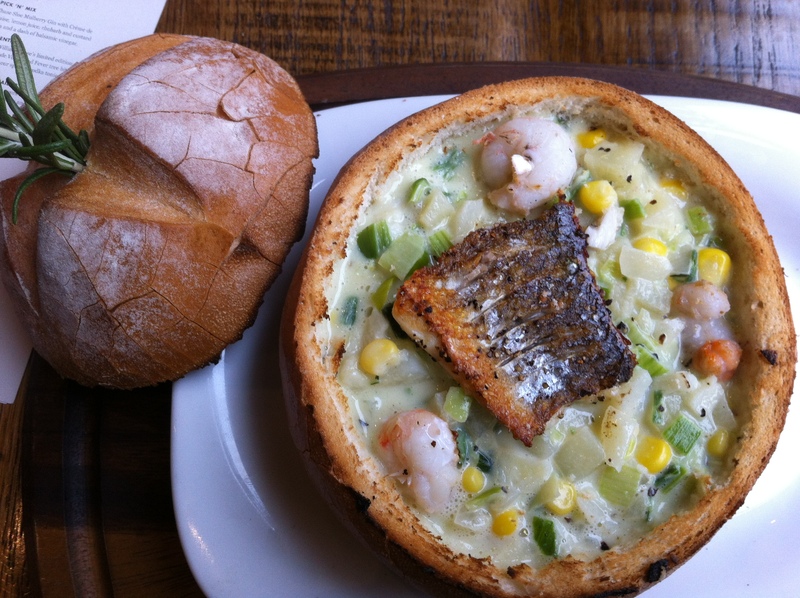 I’ve been dying to sample their Fish Chowder in a Sourdough Bowl – which is one of the most memorable dishes I’ve ever eaten, courtesy of the infamous Boudin Bakery in San Francisco’s Fisherman’s Wharf. 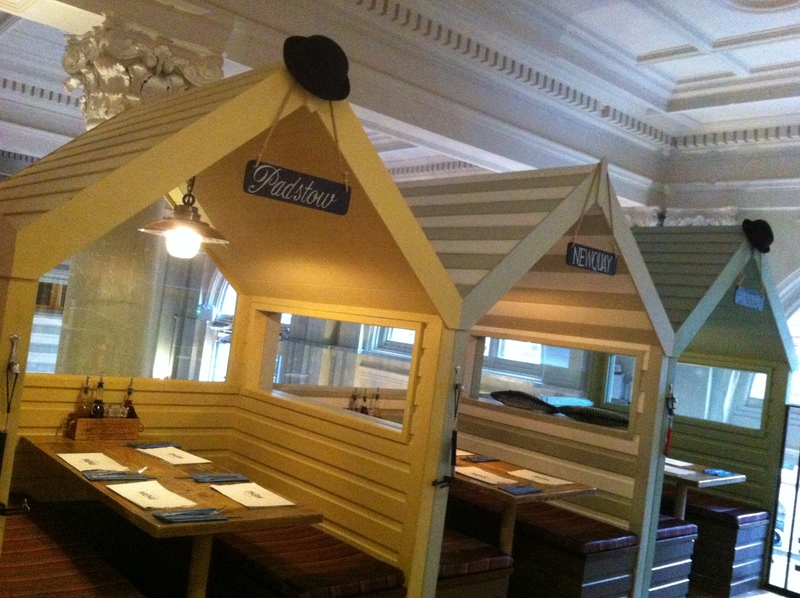 We loved the restaurant, especially these cute little beach huts and the newspaper-esque menus. And we happily devoured our delicious Fish Chowders, yum yum. Mum then went off to do a little shopping, while I headed straight home, tired but very happy. So with this in mind, my happy for today is being grateful for spending a lovely day out with my mum. Previous Previous post: Day 73: Yahtzee!